money and effort into helping the community. Below are a few projects in which the officers have participated. 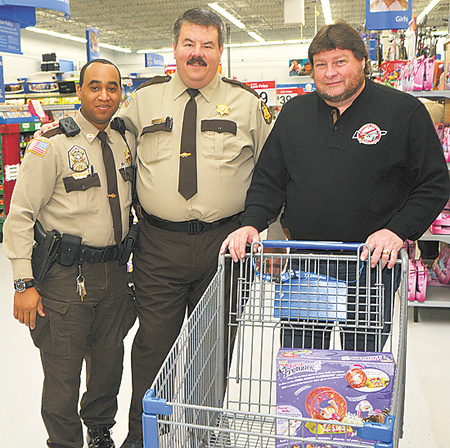 The Carroll County Sheriff’s Office, in partnership with the United States Marine Corp, collects toys and distributes them around Carroll County to needy children. In 2011, 253 needy children were helped. Drop off locations were set up around the county to collect toys. Private monetary donations were made to help purchase additional toys. During the first year of the program, ten children were helped. During the second year, approximately 100 children were provided toys. The program continues to grow with the help of a strong, giving community. To learn more about this cause, visit www.toysfortots.org. To find out how you can get involved in the local chapter of this cause, contact the Sheriff’s Office, 731-986-8947. Sheriff Andy Dickson and deputies A.J. Butcher and Terry Herndon shop for a young child. HUNTINGDON (December 16) Law enforcement officers helped 77 kids in the county with the “Shop With A Cop” program at Wal-Mart-Huntingdon. Randy Kelly said a total of 27 law enforcement officers “shopped” with children to provide much needed Christmas presents. Kelly said the children purchased clothes, toys, and gifts for their brothers and sisters and parents. Officers, with calculators in hand, kept the children on budget as they accompanied the children in the store. Each child had a $125 budget for the items. Officers from Hollow Rock, Bruceton, Carroll County Sheriff’s Department, Trezevant, Clarksburg, and even one Jackson PD officer helped with the shopping. Kelly said he and Officer Joey Hedge were injured earlier this year after responding to a freak accident in Bruceton where a monument fell on a boy. While off work, Kelly and Hedge decided to restart the Shop With A Cop program, which had previously been run by the local state troopers. Kelly and Hedge and other officers requested donations from businesses, industries and individuals. A total of $10,321 was raised through solicitation. Every child also received a new Bible, said Kelly. “We wanted to keep Christ in Christmas,” said the officer. Every participating family went through an application process. Those applicants receiving gifts from other organized efforts were asked not to apply. Kelly thanked the donors for their gifts of money. “Without the generosity of business, industries and individuals, this would not have been possible,” said Kelly. McKenzie Fire Department and Police Department are conducting a separate campaign to provide for the children’s needs. MCKENZIE – Carroll County Jail trustees helped install vinyl siding at the Habitat for Humanity house being constructed at 15 Donnell Street, McKenzie. Sheriff Andy Dickson and Chief Deputy Kent Smith stand with the trustees at the work site. 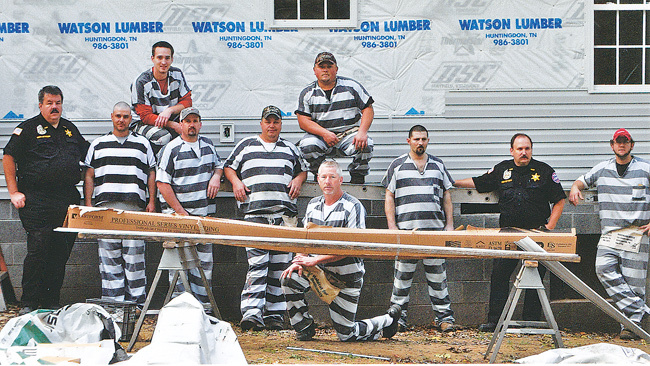 The Sheriff’s Department contacted Habitat to volunteer the inmate labor. The home will be sold to Adam and Jessica Ezell with a zero interest loan. A formal dedication of the home is December 4. The Dickson administration has assigned trustee inmates to assist with governmental and non-profit agencies to provide no-cost labor. Most notably, the trustees have assisted the city of McKenzie, town of Huntingdon, and the county of Carroll on several work projects. Trustees earn time-for-time for their work in the community. For each day of work, the court has authorized a day of reduced sentence. Sheriff Dickson said the trustees are non-violent offenders and earned the privilege of working in the community. Trustees are rewarded with a reduced sentence for good work and good behavior. However, the reduced sentence can be negated if the inmate ‘messes up’ later, said the sheriff. “I am tickled to death with the program,” said Sheriff Dickson, who noted the inmates enjoy working and being able to give back to the community. “They have a sense of self-worth,” said the sheriff. Previous PostMeet the SheriffNext PostD.A.R.E.